Everyone is talking about it being warm this weekend! Could it be?!!?! Is Spring on its way?! Well my fingers are majorly-crossed, and a sunny London means a wardrobe update. I CAN NOT WAIT to ditch the pea-coats for dresses and sandals. I adore silk trousers. They are basically perfect for EVERYTHING, from the office to a date night. These Roberto Cavalli ones are my favorite…. I’m sorry but who doesn’t want a baby pink jersey Ballerina dress from Balmain. Think it’s too sweet? The gold-chain straps give it that slight edge. I am thinking this is a MUST for spring weddings ladies. 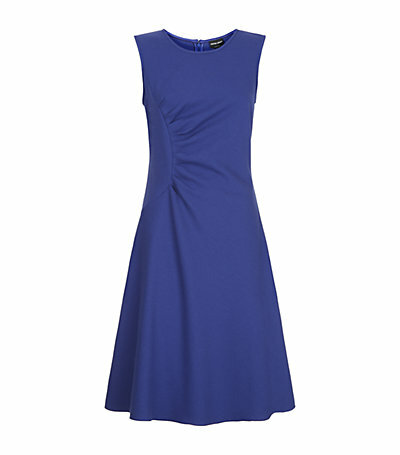 This totally flattering Giorgio Armani number is another perfect Spring staple. Wear with a blazer for work, and change into killer heels for post-work cocktails. This is was done in collaboration with Harrods.